Hand woven by the finest fingers, this silver and gold beaded necklace is adjustable and can be worn with amulets or jewelry of either metal. Dress it up or dress it down. Quartz is a stone of manifestation that energizes and balances the energy centers within the body. Clear quartz moves energy up to open the Crown Chakra, allowing us to focus and become clear about our dreams and desires. Assisting us with our spiritual development, quartz crystal aids in removing blockages in the body so energy can flow smoothly. It is the master healer— helping us balance our entire energy field. Quartz raises our vibration to the highest possible level, purifying and helping us attune to our divine purpose in life. It is connected to the planets Pluto and Uranus. Tulku uses high quality clear Himalayan Quartz in this mala which can be worn long, wrapped around the wrist, or doubled up to make a powerful sparkly statement of light and magic. A mala has 108 beads, which is the sacred number for Hindu and Buddhist rosaries—known in these traditions as Malas. This Mala is especially beneficial in supporting Sahasrara (Crown) chakra. Wear this beautiful handmade woven chain with or without amulets, pair it with silver or with gold. Delicate yet with a weight to it of fine craftsmanship and quality, this one can be worn with the hoops hanging down in the front, or adjusted to hang in the back at different lengths. The ultimate tribute to the Goddess in you, the 7 Chakra necklaces is a necklace, which incorporates all of the chakras in one necklace. The Chakra collection amulets are made using a traditional, hand crafted technique, called repousse. They are made from copper fused with 24k. gold according to an ancient Newari recipe. Our Chakra Jewelry is all blessed by Mata. Each amulet incorporates semi precious stones according to Vedic tradition with the vibration that is appropriate to the chakra to which it corresponds. The small chakras are approximately 5/8 inch in diameter. The necklace is sterling silver with fused 24k gold and cord. For detailed descriptions of each of the chakras, go here. All of our Chakra jewelry and Sacred jewelry is blessed by Mata. The Chakra collection amulets are made using a traditional, hand crafted technique, called repousse. They are made from copper fused with 24k. gold according to an ancient Newari recipe. Our Chakra Jewelry is all blessed by Mata. The small chakras are approximately 5/8 inch in diameter. Length is 16” with 4” extension The necklace is pure silver and cord. Bodhi seeds come from the tree known as the “Bodhi tree”—the tree the Buddha was meditating under when he attained enlightenment. Bodhi seeds represent spiritual promise and possibility, a sense of dedication and faith in nurturing the “seed” of practice. “Within each of us lies a seed, the Bodhi seed, that can lead to our enlightenment. We must create four conditions to help this Bodhi seed grow. Let sincerity, integrity, faith, and honesty be the soil. Let kindness, compassion, joy and unselfish giving be the breeze. Let wisdom and the Buddha’s teachings be the pure water. Let dedication, ardor and diligence bue the sunlight”. The highly prized and once common Bodhi seed is now difficult to find in the markets in Nepal. Rudraksha—the eye of Siva. The seed of the Rudraksha tree holds a sacred place in Hinduism, and is believed to possess mystical and divine properties. The male counterpart of the Rudrani, Rudraksha beads are regarded as auspicious and powerful, and have been worn as a support in meditation practice by spiritual aspirants in Nepal and India for centuries. Ayurvedic texts support the rudraksha’s beneficial electromagnetic effects on ones health by expanding peace and flow on the physical, mental and emotional planes. Each seed has divisions along it which are called Mukhis—or faces. The number of faces each rudraksha has determines which divine energy it embodies. These rudraksha beads have 5 faces which represent Lord Siva— "The Auspicious One"— and are ruled by the planet Jupiter. Five Mukhi Rudraksha are also said to help balance the five elements within us—Agni (fire), Jal (water), Vaayu (Air), Aakash (sky), and Prithvi( Earth). This Tibetan Turquoise supports the Visudha, or Throat chakra and carries the energy of the Earth and the Sky, bringing the awareness of our interconnectedness with all living things into our lives. With 24k gold plated beads on woven waxed cotton. This is not a mala but it REALLY feels good. Double it up or wear it long. Your Choice. You can put an amulet on one end and have the Guru bead on the other. That’s what I do. Turquoise supports the Visudha, or Throat chakra and carries the energy of the Earth and the Sky, bringing the awareness of our interconnectedness with all living things into our lives. Each seed has divisions along it which are called Mukhis—or faces. The number of faces each rudraksha has determines which divine energy it embodies. These rudraksha beads have 5 faces which represent Lord Siva— "The Auspicious One"— and are ruled by the planet Jupiter. Five Mukhi Rudraksha are also said to help balance the five elements within us—Agni (fire), Jal (water), Vaayu (Air), Aakash (sky), and Prithvi( Earth). Coral supports the Swadisthana, or Sexual chakra carries the energy of the planet Mars, bringing the heating energy of Fire and activity into our lives. Finely hand woven on waxed cotton cord with 24k Gold Plated silver beads, Hessonite gems and Rudrani seeds is 16” long and adjusts to 24”. Wear it alone, or wear it with an amulet. Woven waxed cotton cord with 24k Gold Plated silver beads, Hessonite gems and Rudrani seeds is 16” long and adjusts to 24”. Wear it alone, or wear it with an amulet. Rudraksha—the eye of Siva. The seed of the Rudraksha tree holds a sacred place in Hinduism, and is believed to possess mystical and divine properties. The male counterpart of the Rudrani, Rudraksha beads are regarded as auspicious and powerful, and have been worn as a support in meditation practice by spiritual aspirants in Nepal and India for centuries. Ayurvedic texts support the rudraksha’s beneficial electromagnetic effects on ones health by expanding peace and flow on the physical, mental and emotional planes. Each seed has divisions along it which are called Mukhis—or faces. The number of faces each rudraksha has determines which divine energy it embodies. These rudraksha beads have 5 faces which represent Lord Siva— "The Auspicious One"— and are ruled by the planet Jupiter. Five Mukhi Rudraksha are also said to help balance the five elements within us—Agni (fire), Jal (water), Vaayu (Air), Aakash (sky), and Prithvi( Earth). A mala has 108 beads, which is the sacred number for Hindu and Buddhist rosaries—known in these traditions as Malas. The lotus symbolizes the unfoldment of the inner divine potential, the incarnate soul arising from the depths of the physical plane to the total enlightenment of spiritual rebirth. In Buddhism and Hinduism, every important deity is depicted either seated upon the lotus, or holding it in their hands. This representation acts as a symbol of the successful journey from humanity to enlightenment. The Lotus grows out of murky waters and blossoms into an exquisite and pristine flower. Because it closes, retracting into the dark waters at night, and re-emerges in the light of day, in many cultures it is honored as a symbol of purity and rebirth. Plant the seed of this transformation in your life. Do not be afraid of the shadows within you, for they are the mud from which you will grow and flower into your fullness. 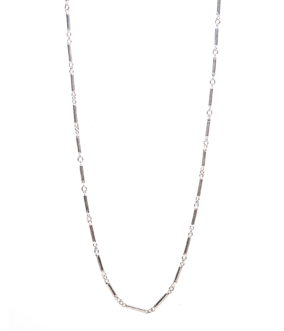 Wear this chain with or without amulets, pair it with silver or with gold. Delicate yet with a weight to it of fine craftsmanship and quality, this one can be looped around and around or worn long. The key words that best describe Lava are— Fire and Transformation. It has the energy of The Phoenix. It was once pure fire in the form of liquid matter, which when cooled, formed into solid rock. Like meteorites, it has undergone a powerful transformation and carries within it’s vibrational experience the energy to help us in our own transformations. 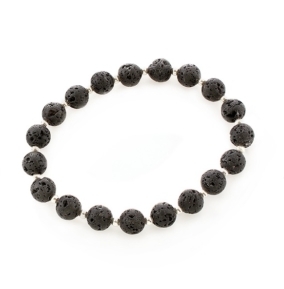 Lava was traditionally used by Native Americans when entering battle for strength and clarity. It is a powerful tool for anyone who needs more fire in their lives, and helps us bring about swift change, transformation, and the fulfillment of our dreams. The energy of lava is powerful, direct, passionate, and focused. At the same time it is a balanced and solid energy which stabilizes us, and helps dissipate anger. In addition to embodying the element of Fire, lava embodies the elemental qualities of Earth—that which it has become. It is a grounding stone that strengthens our connection to Mother Earth, supporting and anchoring us in times of great change. A mala has 108 beads, which is the sacred number for Hindu and Buddhist rosaries—known in these traditions as Malas. It is especially beneficial in supporting Muladhara (base, or root) chakra. Reetha, or soap nut, is traditionally worn by shamans in India and Nepal, and used for healing rituals involving purification, cleansing, and protection. In Ayurveda, it is considered dosha balancing, and is connected to the Muladhara, or base chakra. Soap nut, is harvested for it's powerful medicinal qualities and used in treating a wide variety of ailments by traditional peoples in Nepal and India. The black seed is surrounded by a shell which is composed of a soap-like substance used for cleansing during bathing. The cleansing properties of the Soap nut are employed by traditional peoples not only in the physical, but in the energetic and emotional realms as well. It's grounding, stabilizing, and protective qualities are reflected in their shiny black surface and earthly nature. 24k gold plated silver beads with toggle and clasp 4" extension to 20"
Sterling silver beads and Soap Nuts with toggle and clasp 4" extension to 20"
It is especially beneficial in supporting Muladhara (base, or root) chakra. Knotted Balinese Lava necklace with Sterling Silver clasp, 16.5"
Knotted Balinese Lava necklace with Sterling Silver clasp, 19"
Knotted Balinese Lava necklace with Sterling Silver clasp, 21.5"
The seed of the Rudraksha tree holds a sacred place in Hinduism, and is believed to possess mystical and divine properties. 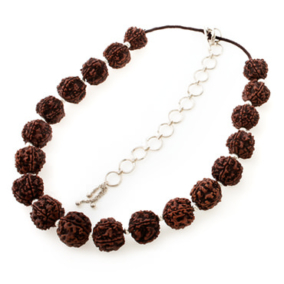 The male counterpart of the Rudrani, Rudraksha beads are regarded as auspicious and powerful, and have been worn as a support in meditation practice by spiritual aspirants in Nepal and India for centuries. Ayurvedic texts support the rudraksha’s beneficial electromagnetic effects on ones health by expanding peace and flow on the physical, mental and emotional planes. Each seed has divisions along it which are called Mukhis—or faces. The number of faces each rudraksha has determines which divine energy it embodies. These rudraksha beads have 5 faces which represent Lord Siva— "The Auspicious One"— and are ruled by the planet Jupiter. Five Mukhi Rudraksha are also said to help balance the five elements within us—Agni (fire), Jal (water), Vaayu (Air), Aakash (sky), and Prithvi( Earth). A mala has 108 beads, which is the sacred number for Hindu and Buddhist rosaries—known in these traditions as Malas. Rudraksha with 24k plated sterling silver beads and toggle and clasp 4" extension to 20"
Rudraksha with sterling silver beads and toggle and clasp 4" extension to 20"
The stones are quartz crystals in the traditional "melon" design from Nagaland, India. Lava with small silver beads, and tassle 108 beads, aprox. 45"
Rudraksha beads with 24k gold plated silver 108 beads mala no clasp ~50"
Rudraksha beads with pure silver 108 bead mala no clasp ~50"
Pearl carries the energy of the Moon, bringing the flowing energy of Water and the awareness of the Divine Feminine into our lives. Pearls and Gold, Moon and Sun, Masculine and Feminine. Works with Silver, works with Gold. Wear the amulets hooked onto the hoops in front or on the beads. Classical or playful. You Choose. Handmade using pure silver and pearls. SInce this is a teeny bead, we made this mala has 216 beads, which is double the sacred number for Hindu and Buddhist rosaries—known in these traditions as Malas. Turquoise supports the Visudha, or Throat chakra and carries the energy of the Earth and the Sky, bringing the awareness of our interconnectedness with all living things into our lives.Turquoise and gold, sky and sun—ocean and sparkle. Wear Turquoise for the communicate creatively and with power— speaking your own, true voice. Wear me with an amulet attached to the dangly loops or on the beads. Or wear me plain! I am fun either way. Not a 108 bead mala, but feels good just the same. Turquoise and gold, sky and sun—ocean and sparkle. Wear Turquoise for the communicate creatively and with power— speaking your own, true voice. Pearls and Gold, Moon and Sun, Masculine and Feminine. Works with Silver, works with Gold. 24k gold Plated Sterling Silver with Pearls, hand woven in Nepal. Handmade using pure plated silver and pearls. The ultimate in feminine power—Pearl and Silver. Moon and Ocean. Feel the tides and move with grace and ease. Wrap it or wear it long. Add a blessed Amulet to really swim deep. Bring your Chakras into balance with the Magical mix of Rudrani seeds and seven sparkly semi precious stones that resonate our seven primary chakras. Thought of as the female counterpart to the male Rudraksha seed, the rare and precious Rudrani is a sacred seed born of the Rudraksha tree. When the tree is in full blossom, the Rudrani seeds are shed from it’s blossoms and collected for their blessings. Representing and carrying the energy of the Divine Feminine, they have a sweet presence reminding us to nurture and honor ourselves, just as we would love and honor the Divine. The stones in this mala represent and support our seven primary chakras. The stone of passion, the energy of Ruby is that of the compassionate heart. Coral represents the energy of life force, and the creative energy of kundalini. Yellow Sapphire helps us to attune to the support of the Universe, which gifts us with positive outcomes. Wearing Emerald has the effect of refining our consciousness. It also brings inspiration and attracts abundance. Turquoise supports us in our journey towards integration and clarity of self-expression. The stone of Peace and Dreams, amethyst assists in spiritual and psychic opening. White topaz purifies emotions and actions while activating cosmic consciousness. Rudrani seeds with semi precious stones and sterling silver beads, 45"
Do your Yoga Practice strong while bringing your Chakras into balance. Rudrani seeds and seven sparkly semi precious stones for the seven chakras. With just the perfect splash of gold. Rudrani seeds with semi precious stones and 24k gold plated silver beads, 45"
Turquoise and gold is like the sky with the sun. Add in a sprinkle of sacred Rudrani seeds to represent the Divine Feminine and you’ve got pure magic. Turquoise—Sacred to indigenous peoples around the world, Turquoise helps us to connect with spirit and brings the vast energy of the sky to earth. It aids us in expanding our consciousness, while helping us create a strong base of practicality and groundedness. Turquoise supports us in our journey towards integration and clarity of self-expression. Communication of all kinds and the ability to speak honestly from the heart is one of the gifts that Turquoise offers. It is especially beneficial in supporting the Throat Chakra. When the tree is in full blossom, the Rudrani seeds are shed from it’s blossoms and collected for their blessings. Representing and carrying the energy of the Divine Feminine, they have a sweet presence reminding us to nurture and honor ourselves, just as we would love and honor the Divine. Made from Afghani turquoise, rudrani seeds and 24k gold plated sterling silver beads, 45"
Wear this unique Turquoise and Rudrani Tassel necklace with just the perfect splash of Silver to shine in the yoga studio! The weight to this masterfully hand crafted link chain feels good on the chest. Definately makes a statement! It is solid Sterling Silver and made entirely by very meticulous and caring hands. The weight to this masterfully hand crafted link chain feels good on the chest. Definately makes a statement! It is solid 24k gold plated Sterling Silver and made entirely by the most meticulous and caring hands. 16” extends to 20” Gold plated silver handmade chain. 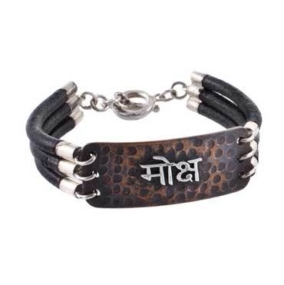 Waxed cotton with sterling silver clasp, 19"
Waxed cotton with sterling silver clasp, 21"
Waxed cotton with gold plated brass clasp, 19"
Waxed cotton with gold plated brass clasp, 21"
Hanuman is the warrior God, an avatar of Lord Siva in the form of a monkey. He is the archetype of fierce devotion and is invoked as a protector and for his powers of manifestation. As a symbol of selfless service, Hanuman’s actions are the embodiment of true humility and service to the Divine. He teaches us how to walk the path of our Dharma with warrior-like integrity and perseverance. While his incarnation teaches us of the unlimited divine power that is our birthright, his strength and perseverance remind us to find the spiritual warrior within. Hanuman is hand made copper repoussé with fused 24k. gold with coral on the back. Also available in pure silver with coral.